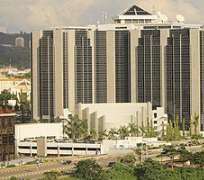 Reports that the Central Bank of Nigeria (CBN) head office building is on fire are false, says the CBN acting Director, Corporate Communications, Mr Isaac Okorafor. According to Okorafor, the rumor started when a passersby saw a pall of exhaust from the CBN generator house and mistook it for fire. “The CBN maintains a total security system that triggers safety alarms in the presence of smoke and so all fire engines and personnel received the alert only to discover that it was an unusual pall of exhaust. “The affected generator has been rested and normal work has been going on uninterrupted, while the engineers are working to rectify the issues with the generator. “We hereby assure the general public that there has been no fire at our building, ” he said. A correspondent of the News Agency of Nigeria (NAN), who visited the bank headquarters, gathered that a huge smoke, which began at about 6 p.m. from a generator located some few metres away from the CBN main building was noticed by members of the public. The huge smoke covered a section of the CBN building up to the roof and left the security guards and other staff on duty in frenzy. However, the situation was brought under control by the staff of bank's internal fire control department.